This lesson provides a basic understanding of why gap winds occur, their typical structures, and how gap wind strength and extent are controlled by larger-scale, or synoptic, conditions. You will learn about a number of important gap flows in coastal regions around the world, with special attention given to comprehensively documented gap wind cases in the Strait of Juan de Fuca and the Columbia River Gorge. Basic techniques for evaluating and predicting gap flows are presented. The lesson reviews the capabilities and limitations of the current generation of mesoscale models in producing realistic gap winds. By the end of this lesson, you should have sufficient background to diagnose and forecast gap flows around the world, and to use this knowledge to understand their implications for operational decisions. Other features in this lesson include a concise summary for quick reference and a final exam to test your knowledge. Like other lesson in the Mesoscale Meteorology Primer, this lesson comes with audio narration, rich graphics, and a companion print version. Too lengthy, all this information could have been relayed much faster if it went straight to the point rather than been diluted with filler. would like it to be broken down a little more in the text version. A fresh look at a topic that's all too oftenmisunderstood, overlooked, or neglected by pilots and by piloting instructors. Cliff Mass' influence is clear! I would like to see lessons updated with more current info/NWPs. Recall where in a gap the strongest wind speeds are typically observed. Describe the different kinds of topographic gaps and their effect on gap flow. List at least 3 natural hazards that may be associated with gap winds. 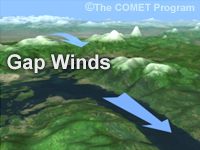 Describe how wind speed varies through the gap during a gap flow event. Describe the temperature profile through a gap during a gap flow event. Describe the pressure profile through a gap during a gap flow event. Describe the conditions required for geostrophic flow. Recall that gap winds are typically non-geostrophic. Describe the origin of the pressure gradients that occur across gaps. Recall that the thinning of low-level cool air at a gap exit can increase the pressure gradient across a gap. Recall that adiabatic warming of downslope winds can increase the pressure gradient across a gap. Describe the horizontal resolution of a mesoscale model required to accurately forecast flow through a gap.